2. The INCARNATION - The WORD was made flesh! 3. The CROSS - No one took His life, He gave it! 4. The BLOOD - No BLOOD, No CLEANSING! 5. The LOVE - We love JESUS, because JESUS first loved us, UNCONDITIONALLY! 6. The PROMISE - Eternal life! 7. THE WORD - Our LAMP, our LIGHT, JESUS never comes up short! The third question that I was asked to address at a recent pastors meeting was HOW IS IT THAT GRANITE HAS SO MANY HIGH LEVEL LEADERS, HOW DID WE GET THERE? So here are a few of the things I shared. 1. Developing leaders is both the hardest and most rewarding thing we can do as leaders. 2. Not developing leaders is to set Gods church up to fail. 3. Develeoping leaders requires an intentional plan. raising up and developing leaders the church is one generation from failure. 5. Recruiting leaders is seeing things in people that they sometimes don't see in themselves. 6. You want leaders who are initiaters, they do not need to be pulled along. 7. Schedule times to meet, pray, and read together, REGULARLY. Remember these are things that I shared with a group of church leaders, church planters who asked me specific questions because of their desire to reach people for Jesus Christ. At the end of the day all we are doing is tring to cooperate with the calling and gifts that God has placed in people. we can never forget that we are not building "organizations" but working with God to mature and develop His church. What an awesome privilege we have as leaders to pour our lives into people! Thats right, you have to have F.U.N.! Study the life of Jesus, I mean really study it, and you will see Jesus was a man, a leader who was ENTHUSIASTICALLY ENJOYED life! Really, with all the responsibilities He had on His shoulders, JESUS HAD FUN! ﻿Ministry is tough enough, and the stresses it brings are real to us as leaders and to our families. So make sure one of the things we all work on is KEEPING IT FUN! What say ye? I HAD THE HONOR OF SPEAKING TO OVER 50 CHURCH LEADER, PLANTERS AND TEAM MEMBERS IN MASSACHUSTTES. THE NEXT FEW BLOGS WILL BE THINGS WE COVERED AS A RESULT OF THIER TOP FIVE QUESTIONS ASKED TO ME. I PROMISED THESE GUYS I WOULD BLOG MY ANSWERS TO THEIR QUESTIONS. MINISTRY - If it was EASY everyone would be doing it. Did you know that in JOHN 6 there were a number of people who QUIT ON JESUS and HIS MISSION? There have always been those who rweach a certain level of committment then fing an excuse, a reason, to ABANDON, to QUIT the mission. If you read JOHN 6:61 you will discover the seed of DESERTING CHRIST is COMPLANING. The truth is the BIBLE doesnt sayanything else about these "disciples" their story, their opportunity seemed to have dissapeared. How sad! So let me encourage you with a few thoughts. 1. COMPLAINING IS ALWAYS THE FIRST STEP IN THE WRONG DIRECTION. 3. Not everyone who starts will finish. 4. John 6:64 says Jesus knows exactly whats in a person heart, dispite thier reasoning. 5. Jesus didnt beg the DESSERTERS to stay, He let them go, He honors CHOICE. YOU IN OR OUT, lets settle this now. I love our GRANITE leadership team, but what we have been called to give our lived too, will not be easy, but it will be worth it. My prayer is that as we enter into the CHRISTMAS SEASON we will decide before hand to BE ALL IN. Lets not let anything or anyone sway us from giving our best to the KING OF KINGS and THE LORD OF LORDS! I love this picture, and I have been thinking about HOW LOVED we are by Jesus. Doesn't the thought that JESUS DID FOR US WHAT WE COULDN'T DO FOR OURSELVES just flood you with all kinds of emotion? 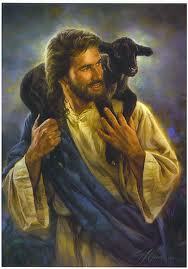 He is THE GOOD SHEPHERD! This picture also reminds me of the responsibility and privilege we have been given by the Lord to care for HIS SHEEP on His behalf. As leaders we have the AWESOME OPPORTUNITY to pour ourselves into our teams. So here's what I want to ask you to do. Over the next few days look at this picture, over and over, and think about how THE LORD'S EXAMPLE should influence your leadership and what does that look like practically. Take the time when you are ready to comment on the BLOG PAGE.